The end of the road? It’s Macquarie or bust for UTOPIA – Free UTOPIA! Part of the visit with UTOPIA was figuring out how they’re moving forward and assess the financial health of the operation. Unfortunately, it looks like despite hitting a number of financial targets, they’ve fallen short financially. Right now, they’re still running a deficit on operations (I hear around $150-175K-ish a month) and it’s not closing as quickly as they need to meet the home stretch of the UIA plan. Right now, break even is about three years out as they concentrate on business customers. Given that subsidizing operations isn’t an option, that puts them in an operational pickle. They were pretty candid with me when I asked questions. The switch from focusing on homes to focusing on businesses came at the explicit request of the cities. Business accounts cost about the same to get hooked up as residential, but they generate about four times the revenue. Even small businesses are worth about two homes a pop. With limited resources, they have to focus on those specific areas to at least try and cover operating expenditures. The biggest barrier to most businesses is the brand name. 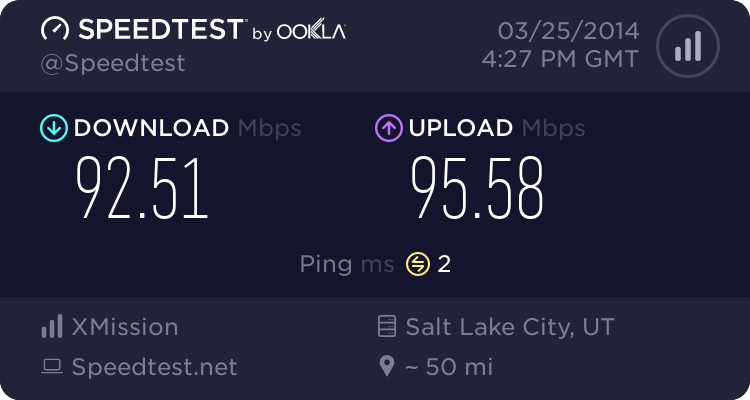 Despite offering great speeds at great prices and excellent SLAs, their PR kind of bites. (Shocking, right?) The limited deployment means it’s much harder to serve multi-location businesses, though service providers have been creative in using UTOPIA where it can be had. Small businesses are challenging because many of them want the reliability of UTOPIA over cable and DSL, but there’s not a cheap enough product offering for them. There’s some bright news, though. They’re signing up about 60-70 new accounts per month without doing much marketing or direct sales, although they could be doing so much more by using a Irvine SEO Company. There’s been a marked increase in high-dollar products like gigabit and even 10Gbps circuits. Most of the cities (including Layton, West Valley City, Murray, Orem, Brigham City, and Tremonton) are using the network extensively for city operations and reducing their own internal costs. If you’re in a completed footprint, you can pay to get hooked up. If you already have the wire on the side of the house, they don’t even have to roll a truck to do it. And operational costs are much closer to being covered than they ever have been. I’ll be blunt: either the Macquarie deal happens or we could be waiting decades for fiber to get to more homes. UTOPIA is pretty fortunate to be negotiating with a company that’s bringing a lot of mutual benefit including the cities retaining ownership of the network. If it doesn’t pan out, though, I think we’re hosed. Tagged Macquarie, UIA, UTOPIA. Bookmark the permalink. Hello, I am the Customer Service Manager @ UTOPIA and I wanted to clarify one thing written above. If we can reach the equipment then we do not have to roll a truck to get you connected. If we cannot then we will have to roll a truck to get you connected. So if you do have the equipment and you’re interested, make sure it’s powered up and you have a CAT5 cable plugged into LAN1 and give us a call and we can check it out for you. We’ve had customers call in that just moved into homes that have been inactive for 5 years and the equipment there has fired right up and we’ve been able to turn them on in less than an hour and get them going. If you have any questions feel free to email Customer Service at support@utopianet.org or call 801-613-3880. We have reps in the office 8am to 5pm Monday through Friday. They need to increase subscribers on areas already passed. One way to do this is to offer a lower performance/cost tier than presently (e.g. 10-20Mbps for $30/m total). Utopia and service providers need to work together to do this and they don’t have to wait for Macquarie to do it. Most potential customers do not need nor do they want to pay for 50M/100M/1G bps. This is why only 11,000 or 95,000 passed homes use Utopia. It’s not rocket science. They need to go after the average user not just the high end user. I don’t know if going with an even lower tier is really such a good option. The margins on such a tier would be pretty low or potentially a money-loser. It’s also possible that some 50M users would downgrade and the additional tier of service may cause confusion. We say we want more choice in service levels, but the reality is that most people really just get confused. Completely agree. Also, I really think advertising needs to happen. A lot of people I know, that are in the area that feeds UTOPIA, don’t know that it even exists. I’ve personally convinced 3 of them to sign up. I don’t know about other users, but I want to dump cable/dsl as soon as I can. I’m pushing for the network to finish the build-out and will be disappointed if the Macquarie deal doesn’t pan out. If it does go under, what will happen to those that already have the service?? Will it end? UTOPIA is extremely unlikely to “go dark”. What would end is building any new areas. I also suspect that a number of staff would be laid off to slash operating costs to a break even point, so customer service may suffer. I don’t see much of a possibility that the cities will not collectively go forward with the deal. It has very fair terms and makes more sense than any of the other options on the table. I do want to make sure everyone understands, though, what will happen if it does not move forward. It’s especially important for perennial holdout cities like Payson and Tremonton to get on board. So even though my new place has Utopia already installed, they can’t give me the Legacy cost because of the 30 day limit is past. The owners disconnected back on 1/22, but didn’t post the house on the market until 3/1. The best you can get is avoid the 2 year contract for the $30+$35 ($65). It’s much better than forking out the $2750. I’d do the large sum only if the deal didn’t happen. I don’t like the idea of getting a reimbursement $15/month as an utility for the next $15 years. Any other ideas on what I should do? How does this work? From what I understood, the actually fiber connection into the home and installation of the fiber gateway performed by Utopia is the one-time fee or the monthy installment with the lien on the home. Wouldn’t think that it could be disconnected and new owners would be asked to repay the same install fee to Utopia. This would be the same as future home owners being asked to pay for a gas line or electric run into the home since the Utopia fiber connection is being treated the same as any infrastructure in the house? Rich, that’s correct, but some homes were connected before that plan went into effect. That’s where J. Lee is getting stuck in limbo. If the previous owner was a legacy account that has already been disconnected over 30 days, Utopia will allow you to avoid signing a 2 year contract and just pay the $30 month to month. So the total for the 100mbit line is $65/month with no contract. I signed up with Utopia and XMission on Monday. It was setup before I even got a key to my new house in Murray. I always thought the connection was sold with the home. Isn’t that the reason they can put a lien on the house, or that the house is sold “with UTOPIA”? This looks to be a case of a leased legacy connection, so that wouldn’t apply here. The previous owners had the install under the legacy contract. Because of that Utopia didn’t make me sign as the equipment was already working and installed. There’s really not a lot of other options at this point. You can either do the install fee up front (which I would recommend rolling into the price of a house when you buy), financing over 10 or 20 years if you live in a UIA city, or you get the 2-year contract that basically leases the connection. Macquarie will change that later this year. Do we know any specific on the Macquarie deal and how it affects current customer’s. If I am on a 2-year lease and pay $30 to Utopia each month will Macquarie change my agreement? Cheaper, more expensive or stay the same until my lease is up? I have seen alot about the new customers but very little about current customer. Lease customers will probably get a price drop. The utility fee is supposed to be between $15 and $25. That will include a basic level of service for free (I hear 6M/2M). I don’t know if service provider rates will also change.